Marcia J. Johnson, age 78, of Erie, passed away Saturday, August 18, 2018 at her residence. She was born in Union City, PA, on December 15, 1939 the daughter of the late Marvin and Ruth Morton Johnson. 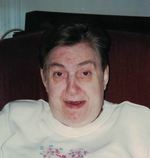 Marcia resided with Lakeshore Community Services. She was very sociable, always loved being around others. Marcia enjoyed collecting dolls and loved dogs. In addition to her parents she was preceded in death by her sister, Elsie Brown; her brother, Raymond Johnson; and her two brothers in infancy, Paul and Walter Johnson. Survivors include her brother, Perry Johnson (Joanne), of Corry; her sister, Janet Stevenson, of Jamestown, NY; and many nieces and nephews. Friends may call at the Russell C. Schmidt & Son Funeral Home, Inc. 5000 Wattsburg, Rd. on Wednesday from 10 a.m. until the time of funeral service there at 12:00 pm. Burial will be private and at the convenience of the family. Memorial contributions may be made to Lakeshore Community Services, Inc. - 1350 W 26th St, Erie, PA 16508. To send flowers to the family of Marcia J. Johnson, please visit our Heartfelt Sympathies Store.